J. parapectoralis specimen, Berlin Museum. Physical description: About 9 to 12 mm in length. 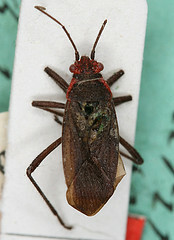 Black dorsal side with reddish brown head; sides of pronotum are red. Scutellum is dark with a reddish center line and tip. Ventral side is brownish black overall but the posterior ends of the abdominal segments are red. Appendages are black. J. parapectoralis has been found in Brazil and Argentina, but the exact locations of where it was collected are not known.